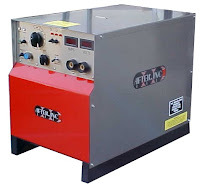 Flexible ceramic mat heaters (also known as flexible ceramic pads or FCPs) are designed to provide stress relief for pre and post weld heat treatments for large scale welding requirements, such as those needed for piping fabrication, boilers, pressure vessels, storage tanks, pipeline construction, and mining equipment. It's very important to pre-heat metal to a specific temperature prior to welding. Pre-heating metals reduces stress in the finished weld, as well as eliminates moisture and improves the metallic microstructure of the weld material. 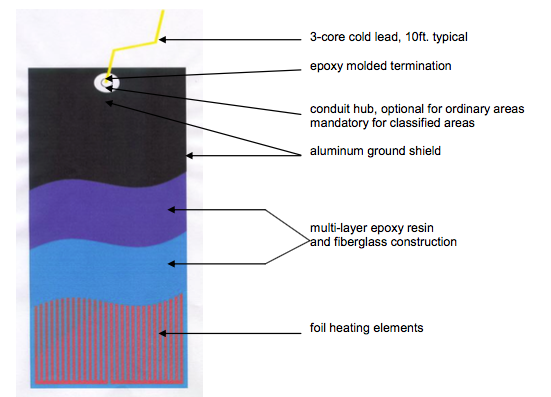 For post weld heat treatment (PWHT), use of resistance heaters to apply carefully controlled cool-down can significantly increase the cross-weld toughness of the heat-affected zone. 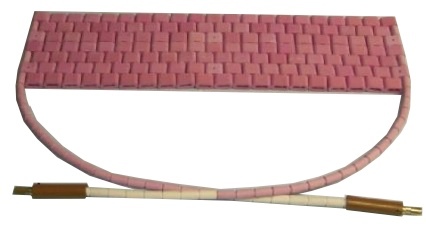 Ceramic mat heaters are manufactured using high grade nickel chrome (NiCr) 80/20 wire insulated with interlocking sintered alumina ceramic beads, providing flexibility and convenience for use on curved or flat surfaces. Their design also allows for good contact and high heat transfer. Ceramic mat heaters are intended for repeated use and have considerable mechanical strength and durability. They are capable of achieving temperatures of up to 2050°F. and are most often are supplied with ceramic insulated leads with either Camlock or Dinse type welder terminations. The most common voltages used are 40, 60, and 80 volts (as supplied by arc welders) but many custom voltages are available. Special sizes, heating patterns and terminations are also easily accommodated with ceramic mat heaters.